The fourth installment of the Monster Energy AUS-X Open Sydney has concluded in front of a sell-out crowd, with current World Champion Jason Anderson taking the win over hometown hero Chad Reed. “To get the win down here in Sydney means a lot – last season we weren’t in the shape we are this year, so it’s a good place to be. This event is so rad with a really cool vibe and super chill, so I definitely hope I’m invited back in years to come,” commented Anderson. 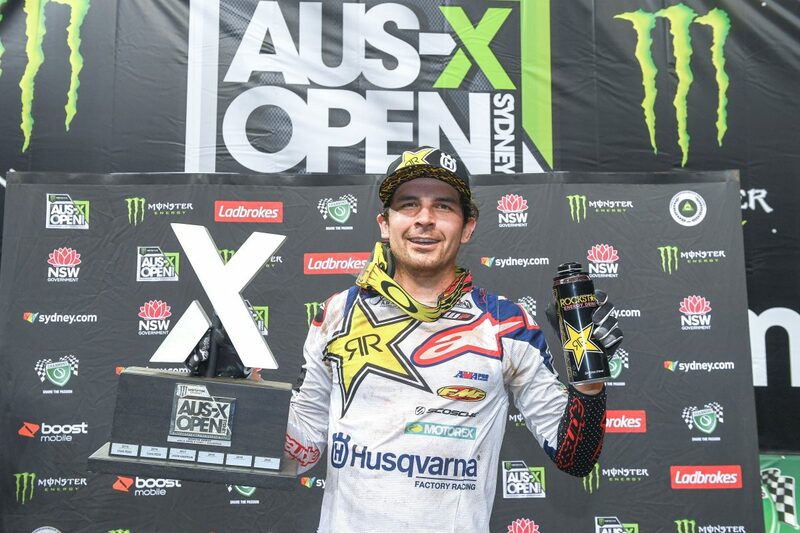 Scotland’s Dean Wilson made a successful return to racing in position two, with Gold Coaster Dan Reardon putting in a solid ride for position three to finalise the podium at the 2018 Monster Energy AUS-X Open Sydney. Both domestic class champions were crowned under the bright lights of Qudos Bank Arena on Saturday night. Each championship was a hard-fought affair this year, with both coming down to the very final race putting immense stress on the riders. The Australian Supercross Championship was decided in Sydney, with American Justin Brayton wrapping up his third consecutive championship. Brayton was followed home in P2 by teammate Brett Metcalfe, with third place going to Reardon. Yamaha’s Jay Wilson completed the ultimate comeback to the sport tonight in Sydney, with the New South Welshman coming back from the brink of retirement just one year ago, to claim the coveted SX2 Championship. Wilson secured the title in dramatic fashion, as he only just qualified for the main event in the final transfer position. The chaos continued to unfold, with Wilson’s poor qualifying position giving him the very last gate pick, and subsequently, he didn’t get off the line well in any of the three races. Despite the drama, tears flowed at the conclusion of Main Event number three, as Wilson was crowned Champion. Championship aside, the race for the AUS-X Open Overall in SX2 was one to remember, with America’s Cameron McAdoo finishing the night on the top step of the podium due to an incredible pace. In position two was 2017 Champion Jackson Richardson, and DPH Motorsports Hayden Mellross in third. The two-stroke cup class was taken out by KTM’s Ryan Marmont, as the age-old rivalry between Craig Anderson and Danny Ham added another chapter in Sydney. The two spent most of the race dueling with each other for the final place before Ham crashed into a wall in a desperate pass attempt on the final lap. Victorian Ace Cheyne Boy claimed the coveted Best Whip competition, finishing ahead of 2017 Champion – Corey Creed, and Honda rider Steve Mini. In Best Trick Blake Williams took gold, with Harry Bink getting the silver and Rob Adelberg with bronze. In the Boost Mobile International Showdown Chad Reed lead team Australia to the win over the Americans. Finally, in the Monster Energy Best Trick competition Blake ‘Bilko’ Williams took the spoils with a 360 splits and a cliffhanger backflip to claim the trophy. The S-X Open Oceania Championship now rolls onto New Zealand in two weeks time, with more champions set to be crowned inside Mt Smart Stadium for the Monster Energy S-X Open Auckland on November 24.